It's that time of year again when the African-American political elite from across the country and from all levels of government gather in Washington, D.C., to discuss the pressing issues of the day with members of the Congressional Black Caucus during the Annual Legislative Conference, hosted by the CBC Foundation. Nicole Venable, The Root's D.C. insider, provides a day-by-day peek into the week's key events. Thousands attended the Congressional Black Caucus Foundation's annual Phoenix Awards Dinner Saturday night. The four Phoenix Awards recipients this year were U.S. Attorney General Eric Holder, filmmaker George Lucas, Rep. Corrine Brown (D-Fla.) and former Mayor of Charlotte, N.C., Harvey Gantt. 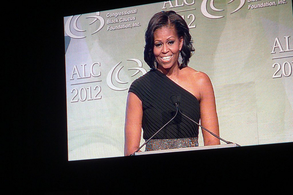 The first lady of the United States, Michelle Obama, was the keynote speaker at the Phoenix Awards Dinner. She delivered a powerful message to the gala-dinner guests about the importance of the upcoming election. The Root's D.C. insider, Nicole Venable (center), enjoys the gala with D.C.'s top event designer Andre Wells and his wife, Robin. The scene from above at the CBC California reception, held at D.C. hot spot Sax on Saturday. D.C. politico Lyndon Boozer (far left) sits with Assistant Democratic Leader James Clyburn (D-S.C., far right) and Rep. Mel Watt (D-N.C., second from right) and their wives at the California reception. R&B singer Tamia treated guests to a lovely performance at the Essence "Evening of Excellence" awards reception on Friday. National Action Network founder the Rev. Al Sharpton delivered remarks about education and its importance for the African-American community at the Essence "Evening of Excellence." D.C. politico Chaka Burgess and Congressional Black Caucus Executive Director Angela Rye at the IMPACT Leaders Preview Reception held at the St. Regis Hotel in Washington, D.C., on Friday. D.C. politico Tene Dolphin with the Rev. Tony Lee of the Community of Hope A.M.E. Church in Suitland, Md., attend the IMPACT reception. Who's that onstage with the Temptations? CNN commentator Roland Martin at the Alabama reception. Columbia, S.C., Mayor Steve Benjamin stands with the national vice president of The Links Inc., Glenda Newell-Harris, Thursday evening during this year's CBC ALC gathering. Mike Strautmanis, deputy assistant to the president and counselor for strategic engagement to White House Senior Adviser Valerie Jarrett, and his wife, Damona, are spotted at the CBC Leadership Reception honoring CBC Chairman Emanuel Cleaver (D-Mo.). Marc Ott, city administrator for Austin, Texas, poses with Washington politico Shawna Watley and his deputy city administrator, Anthony Snipes, at the "Stars Fell on Alabama" CBC Reception. The Executive Leadership Council's director of communications, Catrell Brown, stands with Capital City Chapter Link Nicole Venable. D.C. politicos Lauryl Jackson and Larry Lucas meet with Dallas Congressional Democratic candidate Marc Veasey. Many candidates come to the CBC's annual conference to network with ALC participants, members of Congress and political strategists. IMPACT leader and Obama for America political strategist David Johns poses with The Root's Nicole Venable. Famed 1970s group the Stylistics entertained at the reception honoring CBC Chairman Emanuel Cleaver at the Institute of Peace. The Temptations serenade guests at the CBC's Alabama reception. "Real Housewife of D.C." Stacie Turner and friend Erica Martin pose with top D.C. doctor Lynne Lightfoote Wednesday night. The Root's Nicole Venable with Rep. Cedric Richmond (D-La.). Monica Hairston Cost, author of The Things I Used to Do to Sneeze, poses for the camera at the Congressional Black Caucus' annual conference. Cost's book will be discussed during the CBC's author's symposium. The Root's Nicole Venable stands with Ashley Gammon, press secretary for Rep. Karen Bass (D-Calif.). D.C. lawyer John Burns smiles with BET.com's Angel Elliott. House Ways and Means staffer Moyer McCoy poses with Washington politico Richard Parker. The National Urban League's president, Marc Morial, poses with The Root's Nicole Venable and NUL board member Howard Wooley during this year's CBC ALC. Morial hosted a reception during the conference highlighting the group's voter-education initiative. The NUL's Marc Morial honors the CBC's Emanuel Cleaver for his efforts to educate about voter-suppression efforts. Dell's Mel Parker poses with Natalie Cofield, president and CEO of the Austin, Texas-based Capital City African American Chamber of Commerce, during a CBC reception honoring African Americans in technology.